We love Bali, but it can feel a little crowded at times. One of the islands next to Bali is Nusa Penida. Nusa Penida is a reflection of Bali’s early tourist days. The island is breath-taking, un-rugged and super relaxed. You’ll immediately get that groovy island-vibe feel when you step off the fast boat onto the white sandy Nusa Penida beaches. 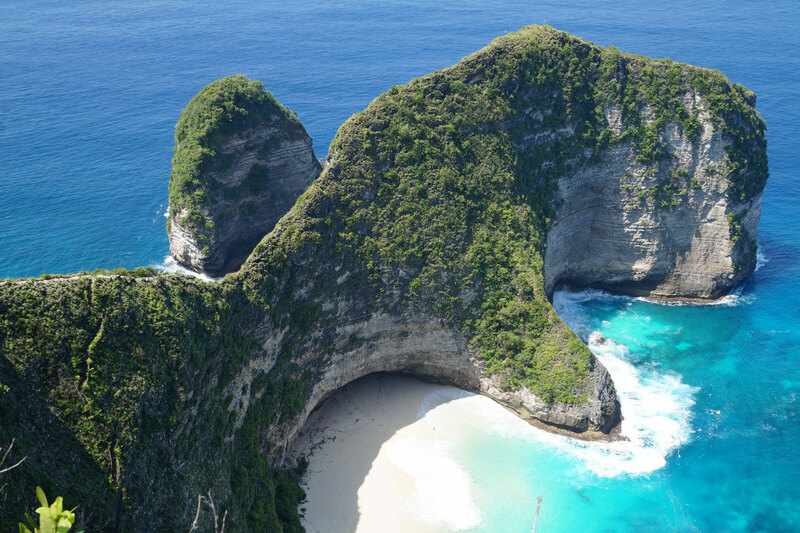 This Nusa Penida guide we’ll make planning your trip super easy! Nusa Penida is the biggest of the three Nusa Islands, Bali and lies just 25 minutes by speed boat off from the mainland Bali. The other two islands: Nusa Lembongan and Nusa Ceningan, make this trio of islands complete. All three Nusa islands provide that feel good island vibe that only little islands seem to have. If you’re a keen diver any of these three islands will suit you. 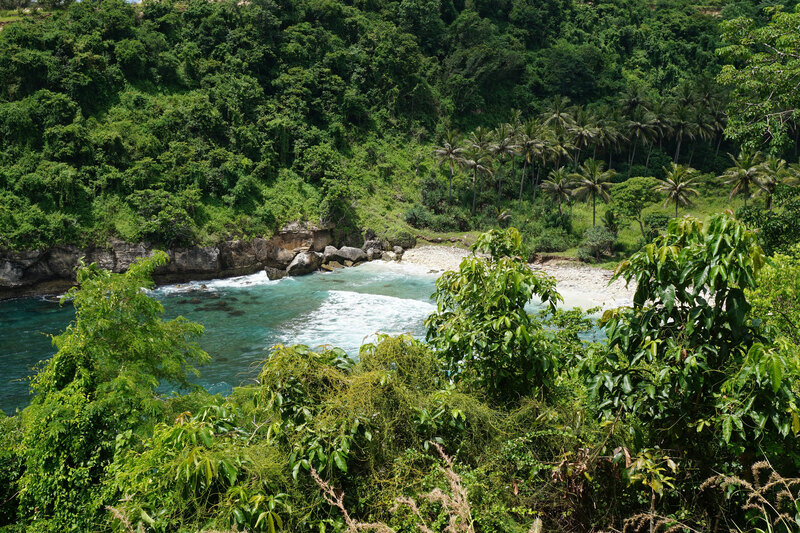 If you’d like to explore some hidden beaches, climb some steep cliffs and drive around on your motorbike on uncrowded roads; Nusa Penida is your best pick. In this extensive Nusa Penida travel guide we’ll take you along our favorite sights, recommend our top picks for accommodation on Nusa Penida and share all our other insights. 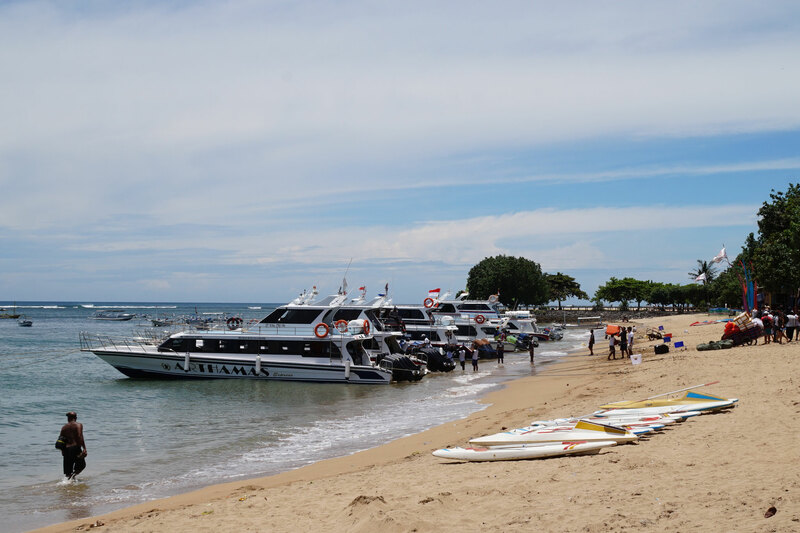 Let’s kick this Nusa Penida guide off with one of the most frequently asked questions: “how to get to Nusa Penida?” Fast boats depart multiple times per day from the harbor in Sanur. The harbor is situated in the north of this beach town and especially outside of peak season, you can just rock up and arrange yourself a seat. In high season it might be better to book your ticket in advance to avoid having to wait or not being able to go at all that day. One of the services we love is by Angels Billabong Cruises but you can also take one of the other providers. The ride to Nusa Penida will take about 25 minutes and can be a bit bumpy when the waves are choppy. If you are sensitive for seasickness, make sure you keep your gaze at the horizon or take a pill against motion sickness. Ticket prices may vary throughout the seasons. In low season you can expect to pay around 350.000 IDR for a return ticket Sanur – Nusa Penida. 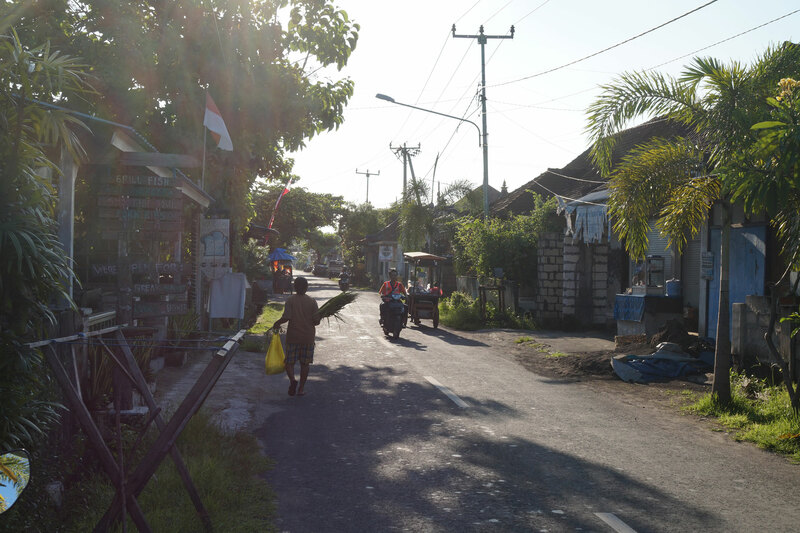 Once you arrive on Nusa Penida you will receive a warm welcome from taxi drivers and motorbike rentals. If you haven’t made any pick-up arrangements, you will either have to choose a ride to your accommodation by motorbike or car. Depending on where you stay, you should expect to pay 50.000 up to 100.000 for a transfer. 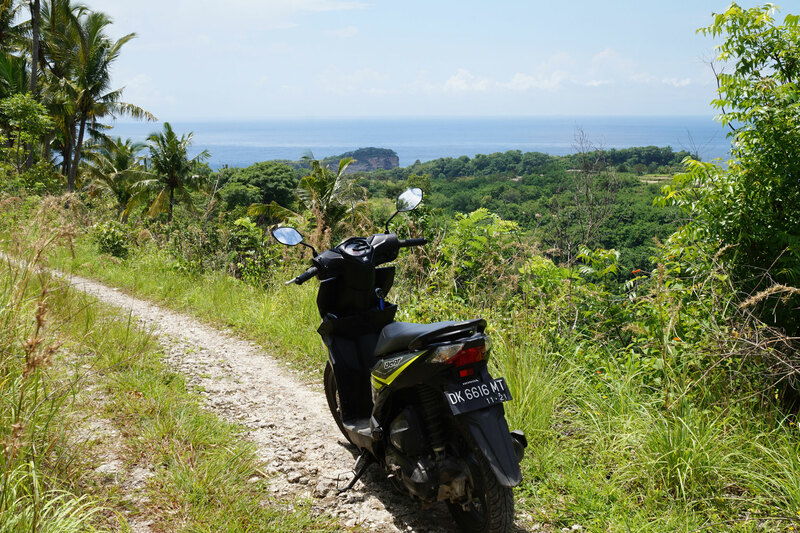 If you want to tour Nusa Penida by motorbike, you can also rent your bike upon arrival and have your ride arranged for your whole stay. Again, prices vary and are a bit higher than the mainland Bali, but you should be able to rent a scooter for 60,000 up to 80,000 a day. Mind you, insurance is never included. You rent on a ‘you break you buy’ policy. If you prefer to discover the island by car and driver, you may expect a day rate of around 750,000 per day. 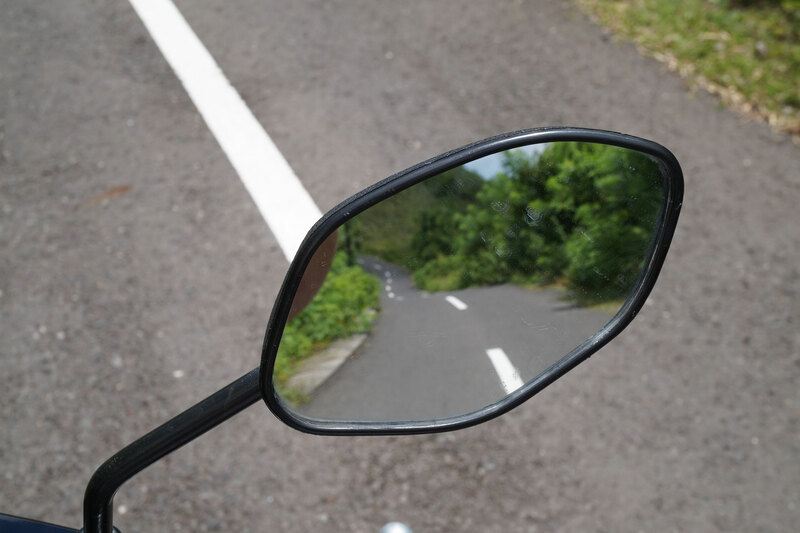 Before you decide on renting a scooter or going with a car and driver, it’s good to realize that the roads on Nusa Penida are not like you have seen on the mainland of Bali. The ‘ring road’ is hilly and windy but generally in good condition. 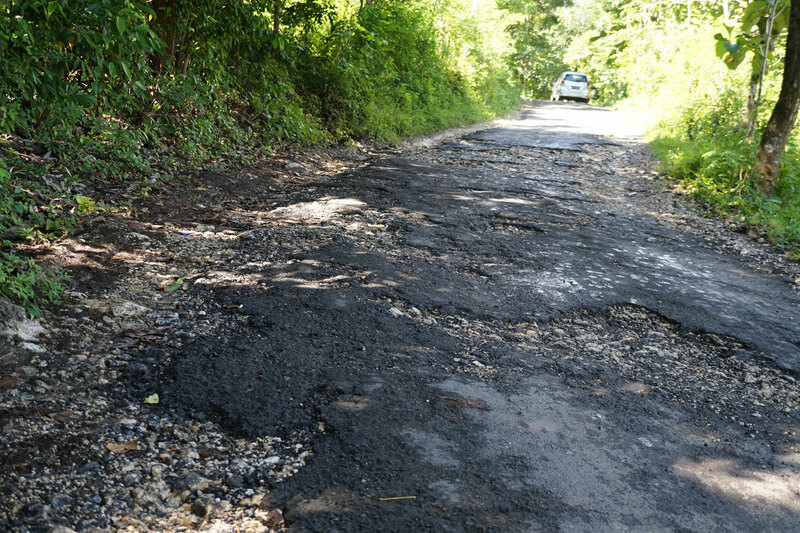 As soon as you leave the main road, which you will for nearly every sight you want to visit, the roads are from gravel and full of holes. Especially when you are with two people on a bike it can get very uncomfortable for long distances. Good to know: helmets are rare on Nusa Penida. Nearly no motorbike rental will provide a helmet. Some have helmets when you ask for them. Most accommodations on Nusa Penida are located in the North of the island along Jl. Ped Buyuk. The road stretches along the whole north side of the island, around10 kilometers, and you’ll find dive schools, restaurants and all kinds of accommodation everywhere alongside the road. Especially the first 3 kilometers are popular as that is where most dive schools are located. If you are more into a resort holiday stay, have a look at the beach hotels near Crystal Bay. 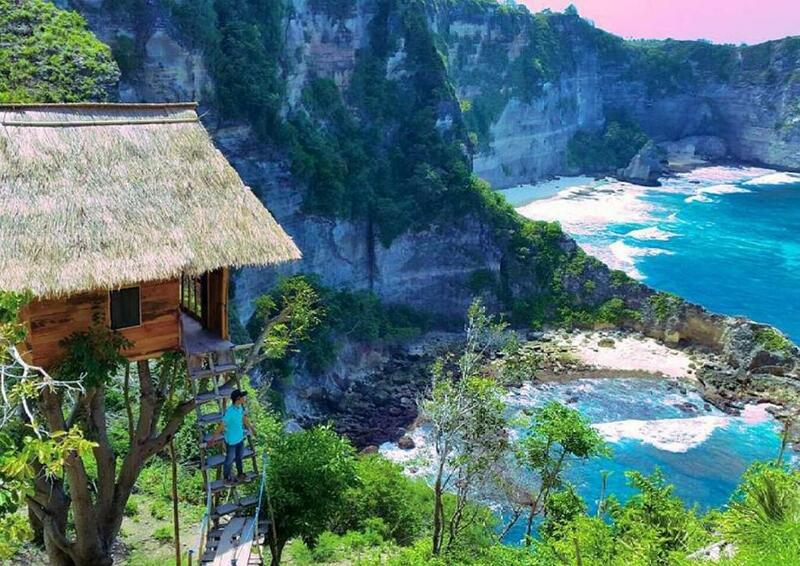 Looking for a little adventure, Nusa Penida offers several tree hut accommodations of which the one near Atuh beach is our absolute favorite. 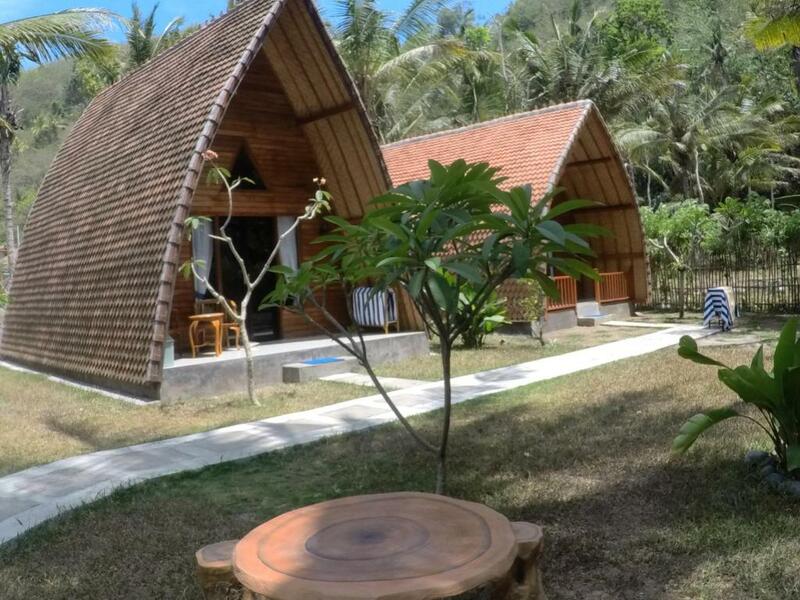 However, our ol time favorite place to stay on Nusa Penida is a nice little health hub in the hills far away from the upcoming hustle and bustle: Echo Alam Nusa Lodge which has an awesome vegan kitchen and really simple but cute bungalows. 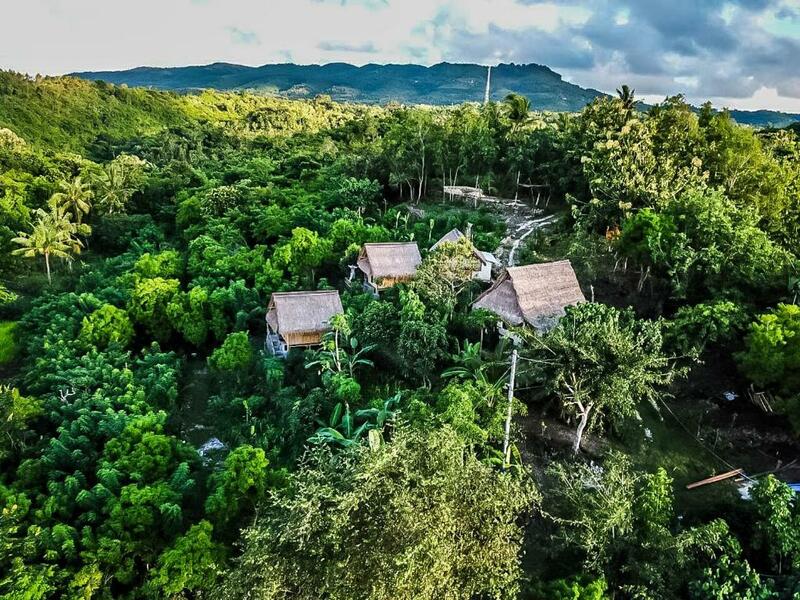 When you choose for a stay at Echo Alam Nusa Lodge you’ll have a sense of staying in the middle of nowhere. You can have a lovely walk around the lodge where you’ll find jungle and chickens on the loose. The lodge has a lovely vegan menu which they do pretty well seeing the remote location of the island. The bungalows are very simple but super cute and have everything you need. The best part of your stay will be the view over the jungle towards the ocean where you can see Bali’s Mt. Agung in the background. Set yourself up for a real adventure by staying in this wicked tree house. Rumah Pohon tree house is situated in the south of the island near Atuh Beach. It’s a great spot for one night when exploring that side of Nusa Penida. It’s a bit of a climb to get to your room, but hey, the view of the ocean and the mountains is just epic. This is definitely a stay that sticks with you for quite a while. Our favorite topic, food! Seeing Nusa Penida is quite the remote spot, don’t expect luxurious restaurants with trendy dishes. It can easily happen that ingredients are sold out and that dishes are not available for a few days. Nonetheless, we did find some really nice local warungs that we happily share with you. We absolutely loved Warung Tu Pande for it’s delicious fried eggplant with awesome sambal. 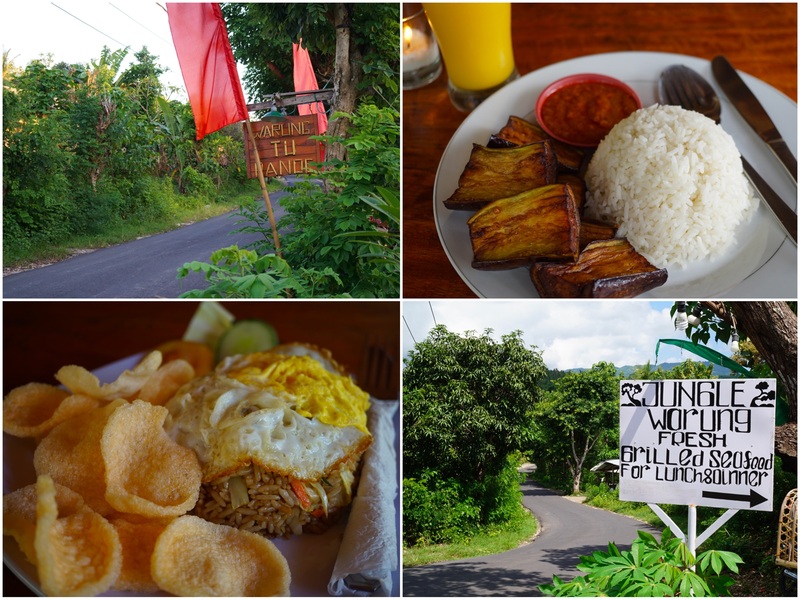 Just down the road from Tu Pande you’ll find the Jungle Warung which makes a killer nasi goreng and if you like it a little fancy go to beach club Penida Collada for a cocktail and a meal. This little island is massive compared to its sister islands Nusa Lembongan and Nusa Ceningan. It has only been very recent thought that tourist found their way to Nusa Penida. Since 2016 tourism has developed pretty rapidly and especially in high season it can get pretty crowded. However, most of the tourist stay in the North of the island and visit the highlights from there. 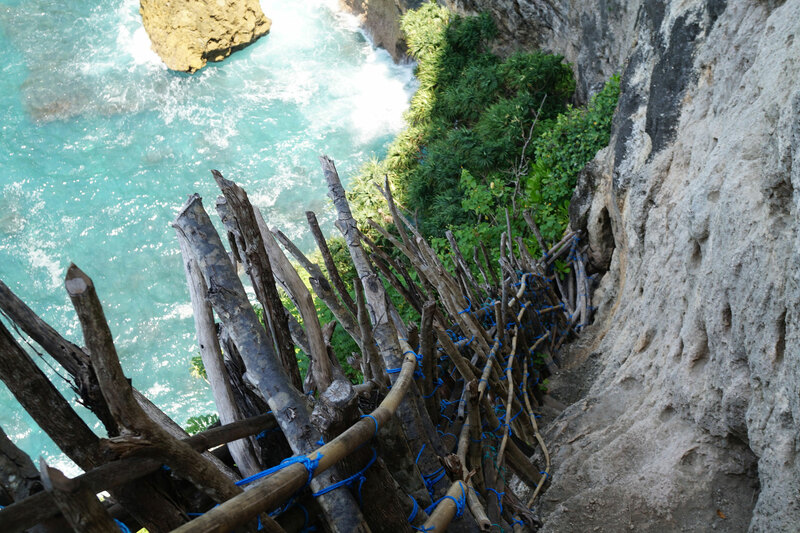 This leaves quite a lot to discover for those wanting to escape the crowds and see some of Nusa Penida’s most un-rugged sights. From all the things to do on Nusa Penida, we share our ten favorites which are a good mix of the highlights and some of the less crowded sights. 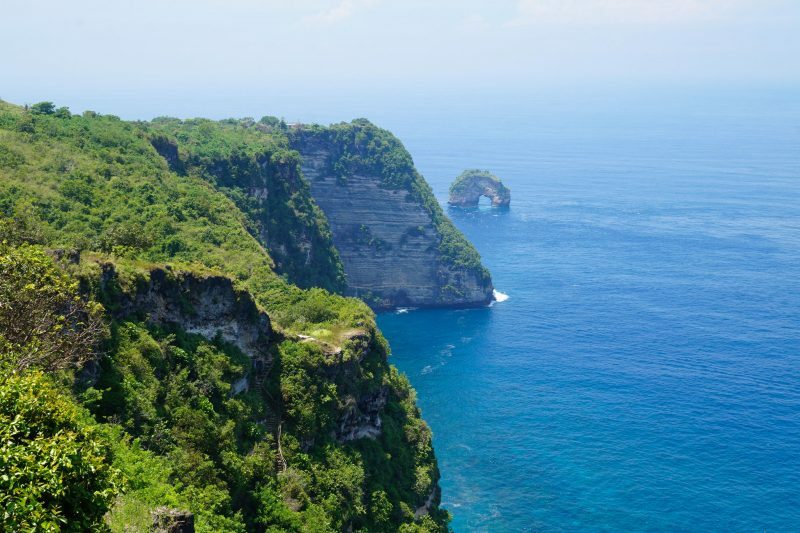 If you’re traveling through Bali and want to go diving, Nusa Penida is your go-to spot. The water is slightly colder from what you’re used to in Bali, but the waters are crystal clear. The waters of Nusa Penida have gorgeous corals, turtles, grey reef and silver-tip sharks, and manta rays. From July to mid-November you’ll even be able to see the exotic Mola-Mola ocean sunfish. Good to know is that there are quite some strong currents around Nusa Penida, this makes that many of the dive spots are more suitable for advanced divers. Malibu Point: the largest variety of sharks at Bali stay at this site. Besides that, you can see trevallies, frogfish and school fusiliers. Sental, PED and S: three dive sites on the north of Nusa Penida that are excellent for drift diving. Blue Corner: another great drift dive spot and, when in season, popular to spot the Mola-Mola fish. Toyapakeh: a wide and interesting reef with the possibility to spot the Mola-Mola fish in season. Gamat Bay: looking pretty rough from shore, this spot is an easy dive site once inside the water with mild currents. Manta Point I & II: these dive sites are the most popular dive sites as Manta Rays can be spotted throughout the year. 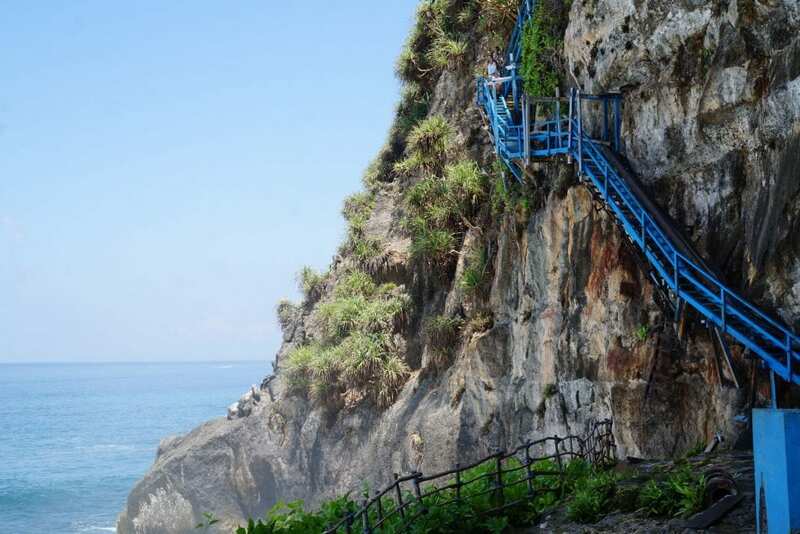 Vertigo Point: a great site to spot pelagics, also known as Batu Abah. 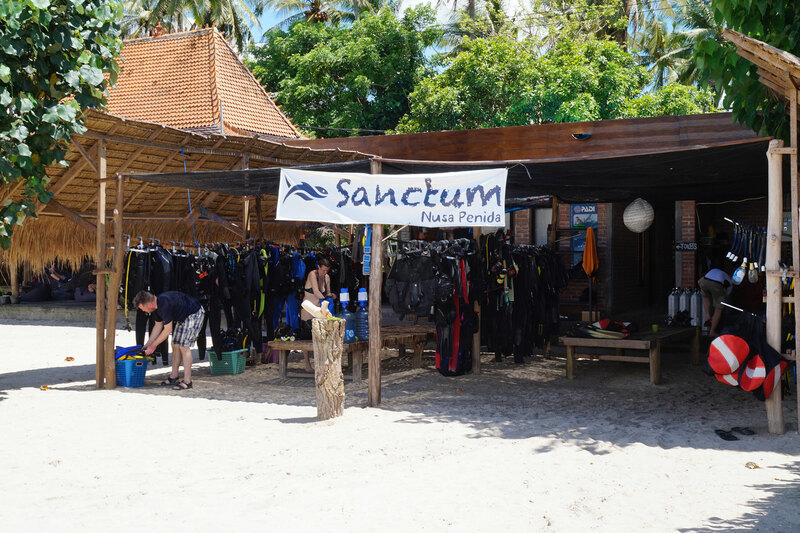 Wonder which dive company to choose on Nusa Penida, we’ve had very good experiences with Sanctum Dive Centre and would definitely recommend them! Crystal Bay is one of the most popular dive sites in Nusa Penida, but it has more to offer than just that. If you’re not into diving you can also enjoy a relaxing day at the superb beach or go snorkeling instead. It’s relatively easy to get to this beach even though you may experience some bumps in the road – in comparison to other beach roads this one is definitely doable though! As the name reveals, Crystal Bay Beach is located in a bay. It is known for its beautiful palm-fringed beach and its crystal-clear water. When the tide is calm you can swim near the shore. With up to 44 meters of visibility, you’ll be able to watch deep down the crystal-clear waters, even if you’re not diving or snorkelling. 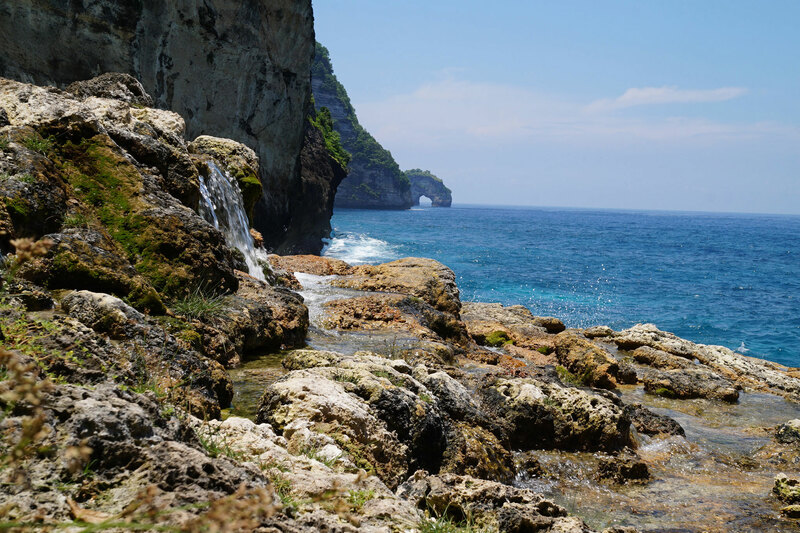 A well-kept secret of Nusa Penida is the Seganing Waterfall. Do we advise you to take the risk and visit this Seganing Waterfall? Well.. let’s say we leave it up to you but if you go, we like you to go with the right expectations. When you arrive at the start of the hike to Seganing Waterfall, you’ll be greeted by a local lady working at a small warung (restaurant). She’ll tell you that it’s totally fine to hike down to the waterfall in your flipflops, but please: don’t do that. This is not a hike for people with fear of heights. This is not a hike for people who are looking for a leisurely hike. Also, good to know is that ‘waterfall’ should be taken very loosely. It’s more a stream coming down the mountain. We’re aware that we’re not selling this sight to you right now but hey, we wish someone had set the right expectation for us when starting this adventure. With the right expectation and the right company, Seganing waterfall is definitely worth a visit. Once down, you’ll be treated to a nice natural bath whilst you hear the waves breaking on the rocks. The view is amazing and it’s just a super serene place to pass a few hours of your day. Bring snacks and enough water! 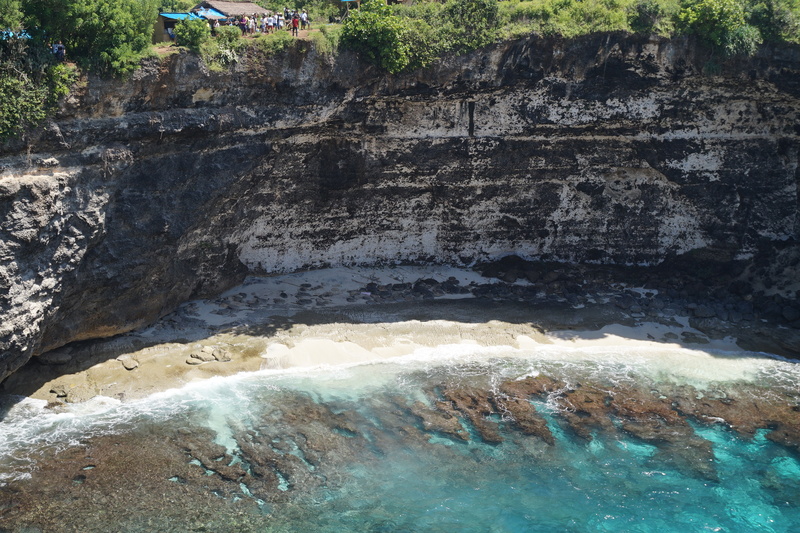 One of the main Nusa Penida attractions is the scenic Broken Beach. The beach is named after the archway that wraps around the bay over the turquoise waters that flow in and out the bay. It’s a must if you’re looking for some Insta worthy shots. The best way to reach Broken Beach is to rent a motorbike to affront the rocky and unpaved road leading to the majestic beach. It’s a one-hour ride if you’re departing from Toya Pakeh in the North of the island. The trip is totally worth it due to its unreal settings, even though you cannot swim at Broken Beach. Right next door to broken beach you’ll find another Instagrammable spot in Nusa Penida: Angel’s Billabong. Angel Billabong features a natural infinity pool on the edge of the cliffs. 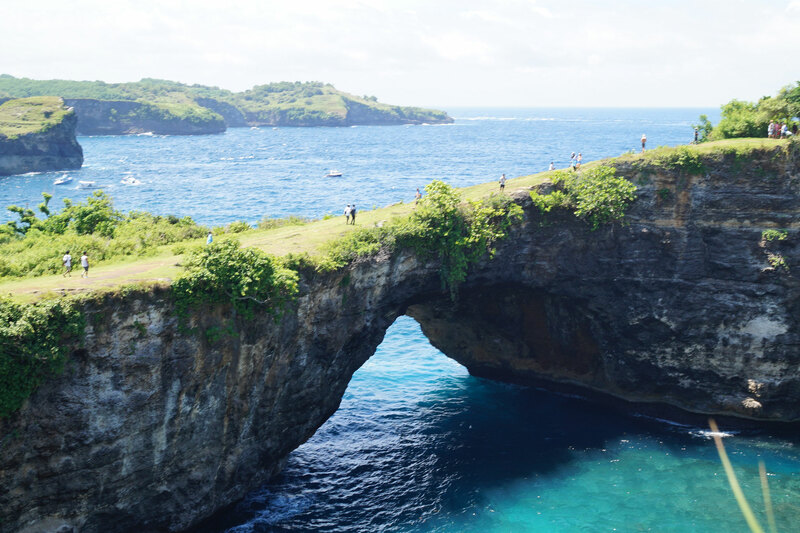 It’s a rock formation and can be found on the western tip of Nusa Penida’s coastline. Once you arrive at Angel’s Billabong you’ll be asked to pay a parking fee of 10.000 IDR after which you can start the journey of stairs towards the infinity pool. Go for a swim in the infinity pool or watch the beauty of nature. You can also spot Manta Rays beneath the cliffs near Angel’s Billabong, so make sure to venture around the cliffs! Nusa Penida has too many beautiful sights to visit, making it hard to choose which ones to pick. Although Kelingking Beach is probably the most photographed sight of Nusa Penida, it’s one of those spots that you gotta see for yourself. 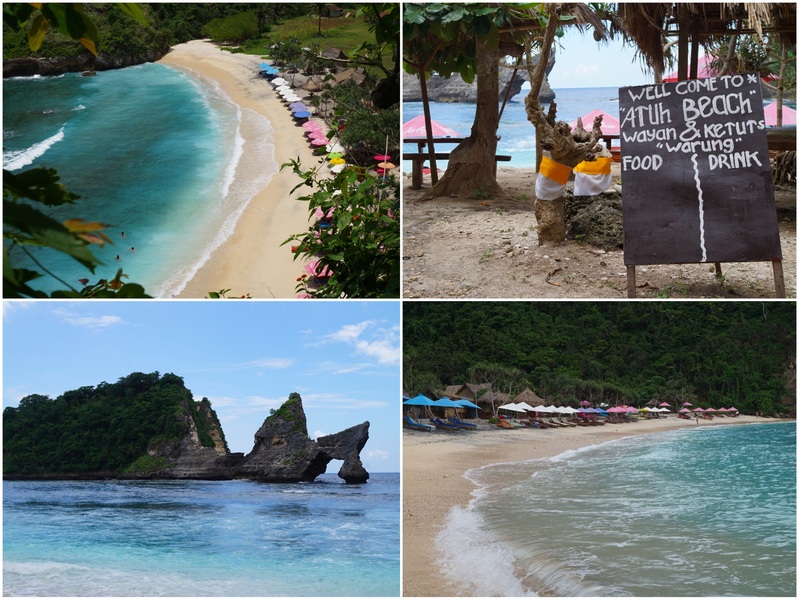 You can get to Kelingking Beach by motorbike in just half an hour if you’re departing from the harbor of Nusa Penida. The main viewing point of Kelingking is just a bit further down the restaurant. From there you can enjoy the views over the beach and the dinosaur shaped Kelingking rock formations. You can walk down from the viewpoint, but the climb is super steep. Only go down if you’re sure you can get back up again and take care of your safety by putting on good hiking shoes. Once you get down the beach. It’s better not to go into the water as the currents are super strong and the waves can get pretty big. 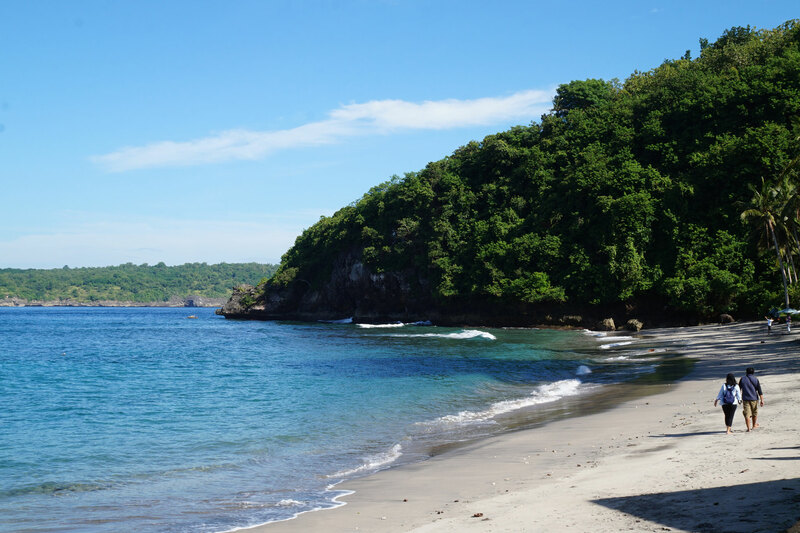 Atuh Beach is a rustic, isolated cove that will take your breath away. The views over the beach are insane and are again very Instagrammable. The roads to Atuh beach are rough, so make sure you take care getting there. You can either park on the left or the right side of the bay, just know that there is a 10.000 IDR parking fee on the right side. The hike down is pretty steep, which you will definitely notice getting back up. Atuh beach makes a great beach day as there are several little warungs where you score a nice local meal and a bintang or coconut. As the name reveals, the landscapes of Bukit Teletubbies resemble the famous green grassed Teletubbies films. Mounds and indentions make it seem like there is an infinity of small green grassed hills. The best time to visit Bukit Teletubbies is either during the morning or evening as the day is usually hot making it unpleasant for trekking through the beautiful landscapes. 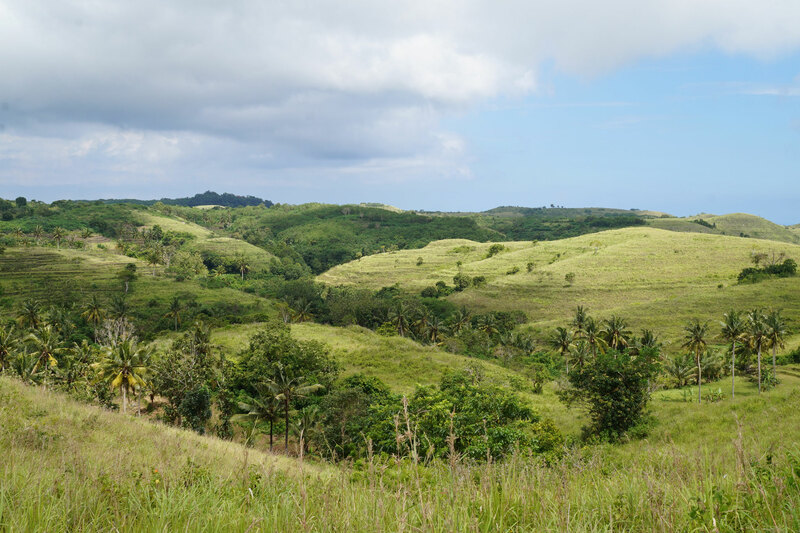 There is no entrance fee for Teletubbies Hills making it a fun free activity for the day. Tip: combine it with a visit to Atuh Beach! You probably think that you can run the world after having conquered all the different unpaved roads of Nusa Penida. Well, this just means that you haven’t been to Sebela Beach yet. This road is so bad that we even discourage you to affront it with a motorbike. You’ll make it down but getting back up is going to be an issue. Drive until you feel you can handle it but park your moped when things are truly getting rough. The beach is only two kilometres from the main road, so you can consider it a nice hike to get there. Sebela Beach is an incredible beach to visit if you have some extra time or if you want to do something off the beaten track. This beach is secluded so you’ll most likely be all by yourself. Good to know: the beach is made up off dead coral. Goa Giri Putri is one of Nusa Penida’s major cultural sights. It is a large cave temple in the village Suana in the east of Nusa Penida. The temple is easy to find and reach. Once you arrive you have to go up some stairs, and once inside you have to pay a donation of 20.000 IDR. You’ll be greeted by a shrine and a priests’ praying shelter guards at the entrance of the temple. Mind you, the entrance of the temple is a magical hole in a massive rock. You’ll feel like you’ll enter a fairy-tale once going through and in some ways, you definitely are entering a whole different world. Goa Giri Putri is not an ordinary temple visit. The miniscule hole in the wall leads you to a gigantic cave full of little temples. If you get to the temple by 9AM you may even be able to attend one of the daily ceremonies. Local people love the interest tourists show in the ceremonies, so you won’t feel like an intruder while there. If you’re not into spirituality, then the ceremony is fun to watch but you will probably be done with it within less than 15 minutes. If you do enjoy learning more about the Hindu culture you can let yourself get lost in the ceremony. The temple is a place to ban demons that take over human bodies. 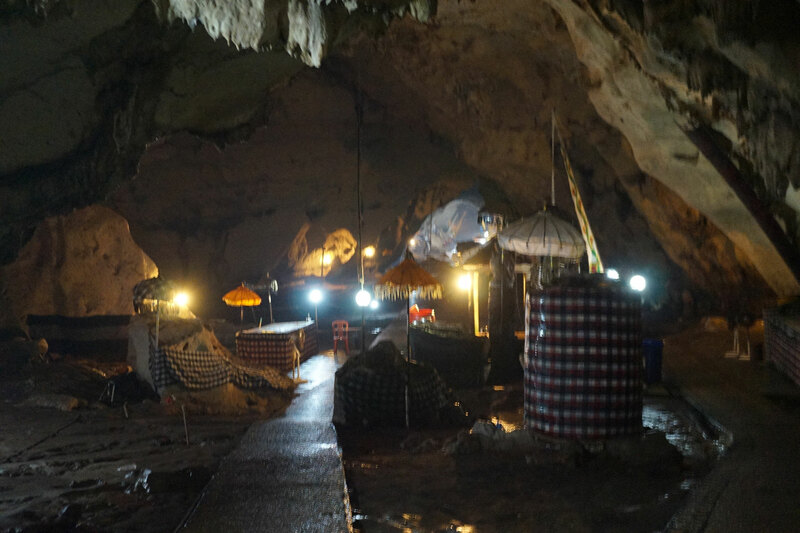 The energy in the cave temple is incredibly strong – you may even see locals faint or scream throughout the ceremony. It surely is an experience to never forget. Another ‘waterfall’ to close the list with things to do on Nusa Penida. Peguyanan waterfall is more visited than the previously mentioned Seganing waterfall. The way up and down to Peguyanan waterfall is much easier to climb although still steep. The colourfull blue stairways will bring you down the cliff to a sacred temple. Again, the term waterfall should be taken loosly here. It’s just a few streams coming down the cliffs, the temple and view are the real reason for making the effort to go down. 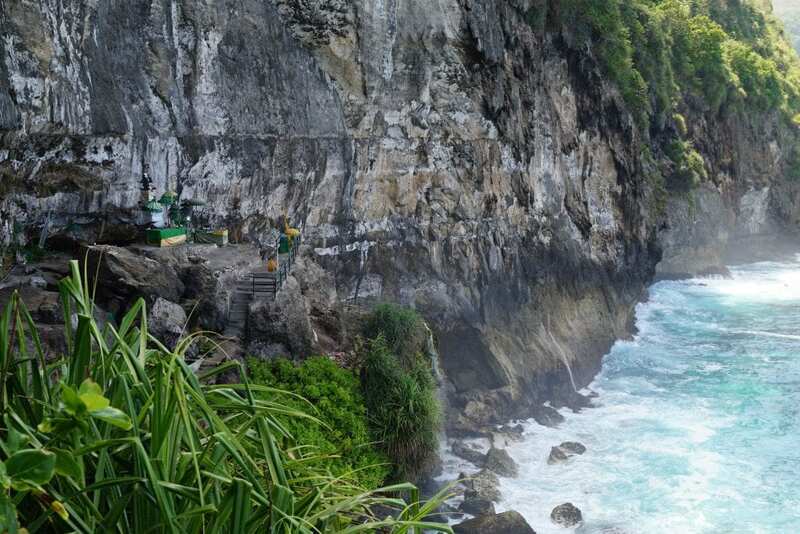 The temple is a pelgrimage site overlooking some of Nusa Penida’s most amazing views. You can easily spend a an hour or two to cool down in the fresh mountain water taking in the gorgeous views. To sum it up, you, at least, need a three day stay at Nusa Penida if you want to get a good impression of the island and don’t want to wear yourself out. With three days you’ll have time to really take everything the island has to offer in. It doesn’t really matter much what route you want to take. You can decide to do day trips from your base in the north or plan an overnight near Atuh beach to change things up a little. 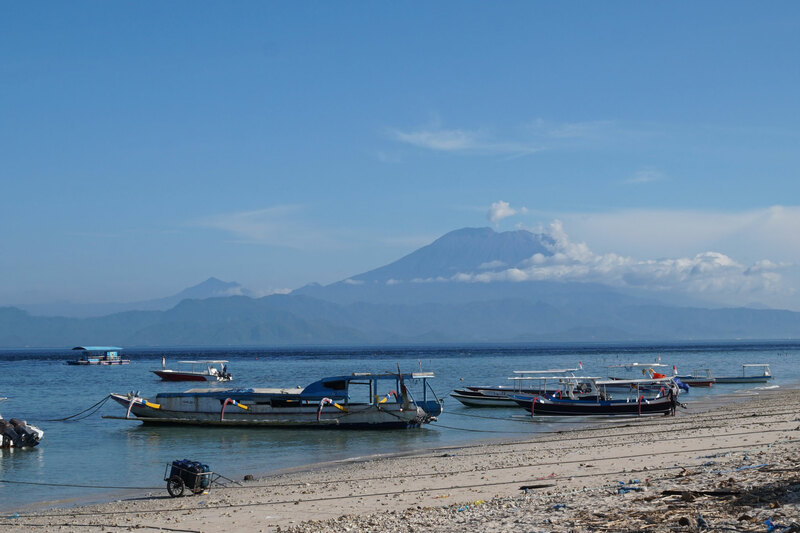 Catch the ferry from Sanur harbor in the morning to Nusa Penida. Rent a motorbike when you arrive and drop your luggage at your accommodation. Visit Angel’s Billabong and Broken Beach during the morning, and relax in the afternoon at Crystal Bay. You can even go snorkeling if you’re not feeling too tired after your travels. 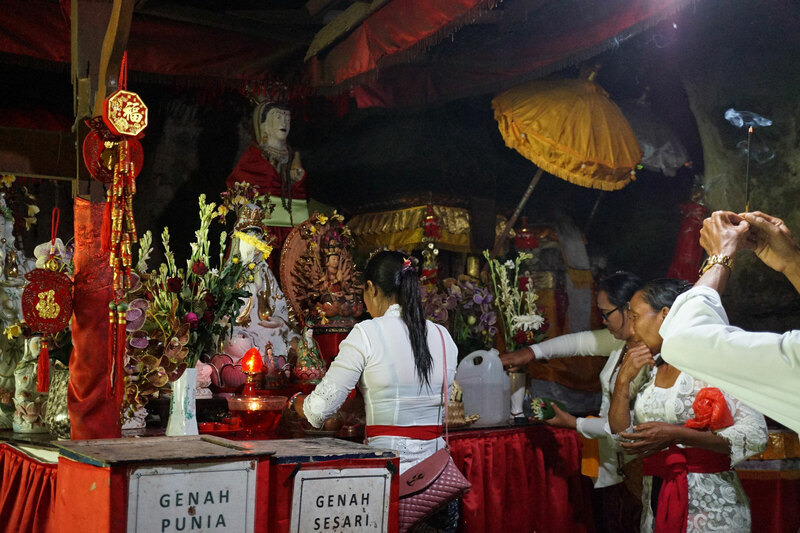 Start your day early and get to Goa Gitri Putri before 9AM to attend one of the daily ceremonies. Take your time before heading towards Atuh Beach to relax, and have a nice Nasi Goreng for lunch. You can head to Bukit Teletubbies on your way back home or overnight near Atuh beach to really take the south of the island in. Kelingking beach is a must in your 3-day itinerary, so make sure to visit it on your last day. Not mentioned above, but the Peguyanan waterfall is a great spot to visit after coming back from Kelingking. 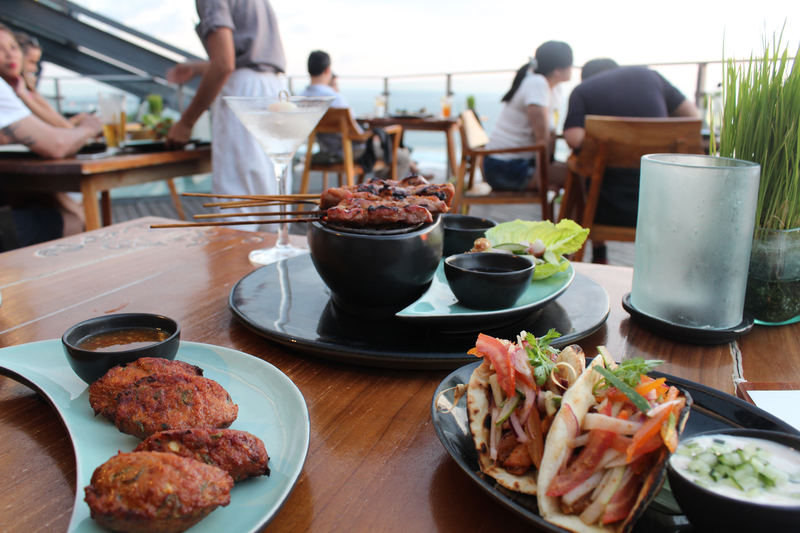 Does this Nusa Penida guide leave you hungry for more Bali inspiration? Check out our Bali travel guide and our guide with our favorite beach hotels Bali. And if you’re really hungry, how about one of our awesome food tours Bali? Let us surprise you with a mystery dining tour along the best restaurants Seminyak and the best restaurants Jimbaran. When you dig a more local style, then the Bali street food tour will definitely still your hunger. Don’t want the hassle of organizing your own Nusa Penida trip?